Twenty-five years ago Sarajevo was the epicentre of a brutal war. Every day for four years Bosnia’s capital city was hit by hundreds of shells. Among the targets were schools, mosques, churches, orphanages, museums and libraries. Ten thousand people were killed, 1601 were children. This is a city that has known suffering and which has housed thousands of refugees from across Bosnia during the war. In 2018, the signs of war and siege are becoming harder to spot. 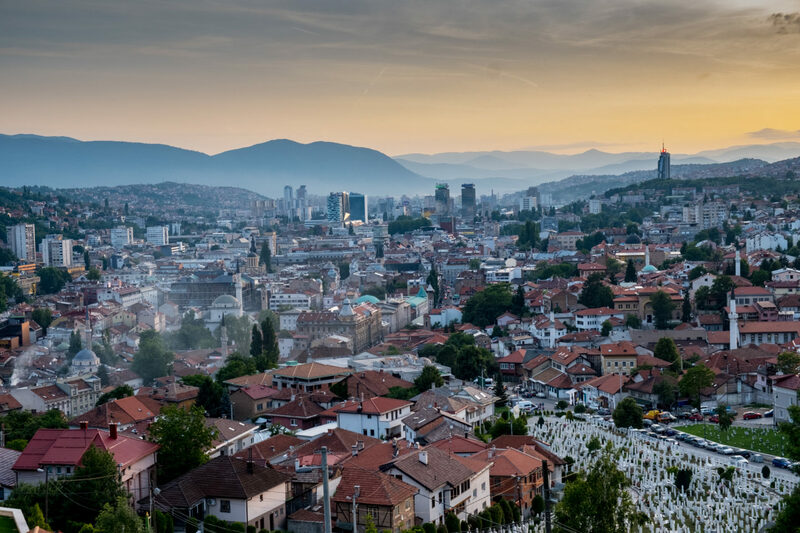 Reconstruction of the city centre, the plastering over shell holes and mortar explosions in high rise buildings and the start of mass tourism have begun to transform Sarajevo. On the surface, Sarajevo could be any modern European city. But in the past two years Bosnia has seen a wave of new visitors and the city has struggled to cope with the arrival of thousands of migrants and refugees from the Middle East and Africa, many of whom end up destitute in Sarajevo and other towns as they seek passage into Western Europe. More than a million migrants came to Europe in 2015 via the so-called Balkan route. According to a UN report an estimated 4,500 – 6,000 people entered Bosnia in October 2018. The borders that surround Bosnia have now been effectively closed by the police and security forces with widespread reports of a brutal crackdown on refugees and migrants by violent Croatian and Serbian police forces. After many months of perilous travelling the migrants have found their journeys stalled and they have become trapped in Sarajevo and other parts of Bosnia, living rough in the streets or in abandoned war torn buildings. It’s the middle of November, and a slightly balmy 20 degrees Celsius in Sarajevo, as Mohammed aged twenty-one from Morocco (pictured below) queues outside the Istiqlal džamija Mosque with a long line of migrants and refugees awaiting one of two daily meals given by local Bosnian NGOs. Recently graduated with a degree in Sociology, Mohammed made the decision to leave his country after going for a job interview and being told he would need to pay a financial bribe to get a job (any job). In the queue are a further 300 or so young men and some families who share a similar story. Some are fleeing wars and persecution in Syria and Afghanistan, others from countries like Algeria and Pakistan and are fleeing corruption and poverty. Citing Sarajevo’s proud history of being a welcoming, humane and ethnically mixed city Adnan Tatarevic from Pomozi.ba, a Sarajevo-based NGO helping the migrants says it is the city’s duty to respond and help. In the outskirts of the city an interim camp for 400 people has been set up but this is already full and over-spilling so many of the migrants and refugees remain within the city and are hungry, homeless and destitute. Rena, from Algeria lives in the Dobrinja area of Sarajevo near the airport. It is an area that suffered some of the worst destruction during the Bosnian war as the front line ran through the neighbourhood. Abandoned war-torn homes remain scattered across the area and Rena has made his home in one of the building shells for the past three months. He lives in one room with four of his friends sleeping on filthy mattresses and keeping all their possessions in one or two bags. There is no running water, no electricity, no heating and there are no windows. He enters the top floor of the house through a small hole in the wall – that way he has some kind of protection but he has no idea who lives in the room next to him and says different people come and go every few days. It’s a long shot if Rena and the other refugees and migrants be able to make will any long term future plans. If they are really lucky they might just make it out of Bosnia. But with a brutal winter approaching promising below zero temperatures, they will have more immediate and pressing concerns ahead just to stay alive. As thousands more refugees and migrants arrive into Sarajevo, NGO workers are convinced the cold winter will claim many lives if more is not done to feed and house them. All pictures by photojournalist Chris Leslie.